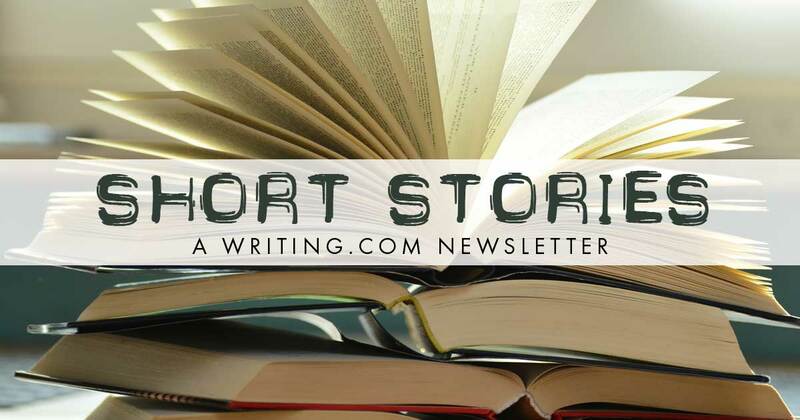 The purpose of this newsletter is to help the Writing.com short story author hone their craft and improve their skills. Along with that I would like to inform, advocate, and create new, fresh ideas for the short story author. Write to me if you have an idea you would like presented. You know what IT is... Sure you do. IT is an idea. Some people have ideas all the time. Some people even write their ideas down. Some go so far as to write the idea, a plot line, character sketches and photos. Then there's some people who like to write but have no ideas. I know, there should be a charity campaign for those people. They walk around, unburdened by voices telling them they need to write. They have a neat conscience, sparkly clean and clear, with nothing but a grocery list and a reminder about their mother's upcoming birthday. I hate envy those people. Unfortunately, many of you are like me. My mind is filled with ideas, scattered among the dust bunnies monsters, clamoring characters and half-baked ideas. I try to write them down, but something blew a fuse between the thoughts I had while sitting at a stoplight and saving them on my computer. A good way for those neatnik brains to gather an idea, or for the messy basket brain to sort one out is to check out the contests being hosted in our community. I'll post a few down below but you can find them anytime by going to the left column navigation, clicking Community, and then choosing Contests. For a starter story idea, click Writing.Com Tools, then click Writing Prompts. Not everything will turn into a story, maybe just a great character sketch, but you will get something going, I promise. And if you get a story written, but perhaps not perfected, enter it in the contest and see what the judge has to say about it. A fresh set of eyes can be great help as you get started. And if the reviewers like your story, think about turning it into a chapter in your character's life. Maybe the story will exceed the contest word count limit, but keep writing, you might have a fantastic novel on your hands. This month's question: Is your mind sparkling clear or a host for dust monsters? Send in your answer below! Editors love feedback! A man is drawn into a dead writer's orchestrated nightmare, can he escape from this evil? Excerpt: Abandoned on the outskirts of a rural town, a rundown town-house resided, it was the source of disturbing folklore. To and from work, an entrepreneur drove by in his flash sports car in awe of its architecture, itching to act on the tattered ‘for sale’ sign barely clinging to its post outside. Recently, moving to the town, he grew tired of living in an apartment, and saved up purposely to take on a restoration project, and that building ticked all the boxes. Jessie's in the game of her life. Can she win it? Excerpt: Jessie wiped her sweaty palms on her jeans, before picking up her cards. She tried to ignore the camera and its green light glaring at her. The crowd gathered around the final table at the World Series of Poker event kept quiet while she used the time to decide. Across from her were two other players, Roy and T-Rex, both far more experienced. How could a carefree day of boating turn into an impulsive prank & a life at risk? Excerpt: The day started out with some carefree boating in the bayou and then an impulsive prank among a bunch of buddies. No one anticipated this. Shaking his head to fling some of the water from his dripping long hair, Steve wondered, What am I supposed to do now? Aren’t they coming back?! Excerpt: I did not have the most pleasant death, concrete shoes in lake Superior, I guess I really pissed some important people off. That happens when a journalists like me start messing with things beyond their knowledge. I sank to the muddy lake bottom ant the concrete filled pail hit the mud. I began to lose consciousness as I gave up and let the water pour through my throat and into my lungs. I stared through the murky water as darkness clouded my eyes, “This is it.” was my last thought. A short story about a program at the State Psychiatric Asylum for juvenile delinquents. Excerpt: The old building resembles a beautiful Greek Temple with its huge ionic columns; however, beyond the doors there is nothing that can be called beautiful. It is the State Psychiatric Asylum which is usually called the Looney Bin. #2181410 by Victor L. Rolling Jr.
Excerpt: "Look, it was a holiday party, we got drunk, I kissed you. That was a mistake. If you want to file a complaint, then do that; but stop making it seem like we had a full on relationship. It's kinda creepy," Liam continues as he adjusts his chair facing his computer. Excerpt: Stieglitz sighed. His accounting work had become boring, and he missed cavorting with "Rita Hayworth" (his name for the curvaceous brunette steno pool typist, actually an executive assistant to the main boss in the head office of the Baltimore IRS) with whom he'd spent a delightful few months staying all week in the penthouse apartment at the Baltimore Executive Towers. “Rita” had not been available since the 1st of November. He thought she had quit her job, but in reality she and the Big Boss Man had flown to Puerto Rico for a two-month affaire de coeur. Last month's question: Do you use personal experiences and anecdotes in your writing? Peacerose responded: When I have the time and the brain isn't being creative, I stitch. Knitting, crochet, sewing, mending, quilting; it doesn't matter just as long as I am doing something creative. Sometimes when engaged in these other activities, I get a spurt of inspiration to write. I stop and write. One seems to fuel the other. dragonwoman sent: Often I pick something out of my memory, change the names (to protect both the innocent and the guilty and fit it into a story. Editing is BLUE replied: I always use personal stories in my writing. Sometimes the whole story is an family story but I can't write them all here, they are usually about dealing with body functions. We all laugh because we've all been there. Some day I'll write a book filled with family stories. I use them all the time. I’m 76 and I’ve been to a county fair and a goat roapin’ or two so I understand the world, and I have a lot of stories. Half or more of the stories I’ve posted here have me in them. And, why not? I know me better than any other person on the planet. I’m also an actor with a few hundred stage plays, my favorite is small, intimate theater, but a few movies and several training videos. I designed computers and taught simulation theory. My girlfriend, an MFA that taught writing in colleges in Texas, encourages me to write themed short stories about some of my experiences for collections. When I get good at this I’ll look to collecting them into groups, editing them again and publishing them. Two about life aboard an aircraft carrier are in my portfolio. Thank you for all the work you do to make this a safe and fun place to be. Thank you for all the responses! Your feedback is much appreciated! Generated in 1.36 seconds at 6:09am on Apr 25, 2019 via server WWW2.